Knesset members Tamar Zandberg (Meretz), Michal Rozin (Meretz) and Stav Shafir (Labor) are claiming they were detained at the entrance to the Western Wall on Tuesday when they sought to pray at the site wearing prayer shawls. Police officers asked them to leave the shawls behind so as "to prevent disturbances" but the three did not heed their call. Women of Wall to policemen: Hands off! Jerusalem District Police said in response that the officers did not recognize the MKs and for this asked them to remove their shawls. After they identified themselves, the three were allowed to enter with the prayer shawls. 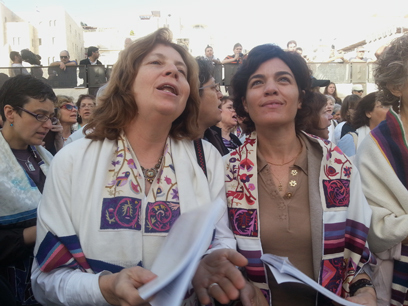 Dozens of members of the Women of the Wall group have been detained in the past six months during and after prayers. 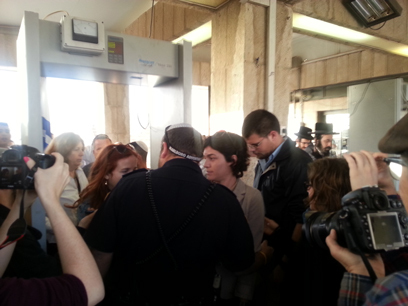 However, in this instance not one woman was detained, likely due to the MKs' appearance. Zandberg said in response that she rejects the extremist interpretation of the Protection of Holy Place Law. "I am a secular woman but I sympathize with these women's struggle for freedom of expression and religion," she said. MK Shafir later tweeted the following message: "I join the Women of the Wall and support them as they pray in shawls in the face of haredi resistance on the other side of the fence, and police threats." On her Facebook account she added, "For 24 years, the Women of the Wall have been praying at a site sacred to the Jewish people and for years they have been stopped just because they seek to pray in their own way. "This morning, following hate banners in the haredi press, I joined them. At first we were prevented from entering the square on the grounds we were disturbing the order but there is nothing that 100 women armed with a shawl can't do." Last December, Prime Minister Benjamin Netanyahu turned to Jewish Agency Chairman Natan Sharansky in an effort to reach an agreement that would end the dispute over the Western Wall's religious nature, so that each and every Jew would be able to visit and pray at the site according to their faith. In January, the matter reached the Supreme Court. The Israel Movement for Reform and Progressive Judaism, women's organizations and various pluralistic movements filed a petition with the High Court of Justice on against the prime minister and the Western Wall Heritage Foundation. The groups demanded that seculars, Reform Jews and women be given equal representation in the management of the Western Wall, and asked the court to remove the control of the holy site from the hands of the Western Wall rabbi. See all talkbacks "Female MKs wear prayer shawls to Kotel"